WASHINGTON – August 10, 2010 – Broad, deep and fully bipartisan public support exists for policies aimed at preparing all high school students for college and careers, according to a new nationwide survey of American voters released today by Achieve. 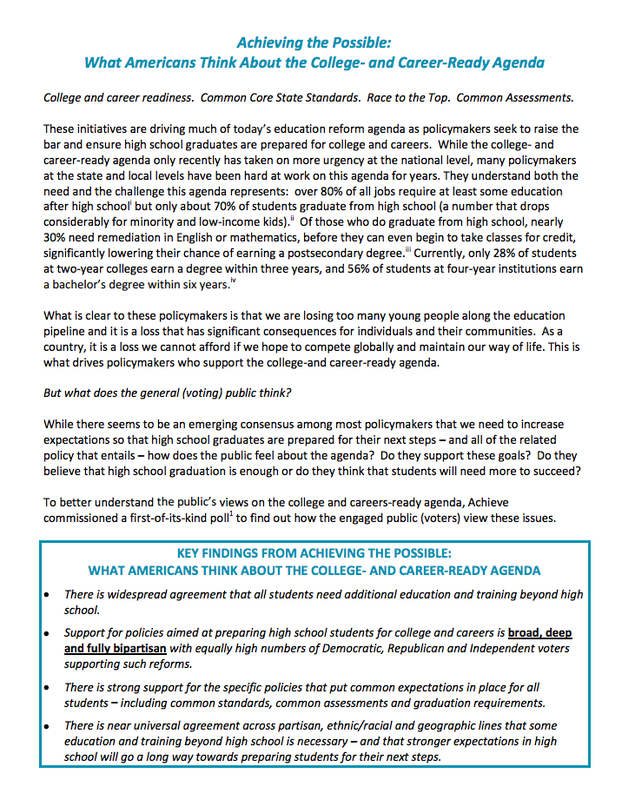 The results of the survey, "Achieving the Possible: What Americans Think About the College- and Career-Ready Agenda," come at a time of increased discussion nationwide about how best to prepare all students for college and careers and just months before 37 gubernatorial races this Fall. Governor Phil Bredesen (D-TN), co-chair of the Achieve Board, and Governor Dave Heineman (R-NE), member of the Achieve Board, joined Achieve staff to release the results. By nearly a two-to-one margin, voters believe it is “better for all states to have the same standards at each grade level in math and English so students across the country have to meet the same expectations” (62%) rather than for states to have “their own standards reflecting their own priorities” (35%). Among voters living in the 21 states with college- and career-ready graduation requirements in place (defined more broadly in the survey but including 4 years of English; 3-4 years of math, including Algebra, Geometry and Algebra II; 3-4 years of science, including biology and chemistry; and 3-4 years of social studies and various electives), 92% support either keeping their state’s requirements (46%) or raising them further still (46%). In states without requirements at this level, 73% of voters believe their state’s requirements should be raised. 86% of voters support “college- and career-ready” graduation requirements for all high school students – with 65% strongly supporting the requirements for all students. This support crosses party lines: 85% of Republicans, 87% of Democrats, and 85% of Independents support these requirements for all students. The support also crosses ethnic/racial lines: 85% of White, 84% of Black and 95% of Hispanic voters support college- and career-ready graduation requirements for all students. The support is shared across all communities: 87% of urban, 86% of suburban and 81% of rural voters and in all regions of the nation (86% in the Northeast, 83% in the Midwest, 89% in the South and 83% in the West). "Tennessee has fully embraced the college- and career-ready agenda as a way of ensuring our students and our state have every chance at success in a competitive, global economy, and I'm glad to see similarly strong support across the country and across party lines," said Tennessee Governor Phil Bredesen. "We now have to focus on engaging this willing public -- parents and community leaders, Democrats and Republicans, rural and urban -- to ensure the sustainability of this critically important agenda." Nebraska Governor Dave Heineman, noting that even with Nebraska's long history of local control, his state was able to pass statewide graduation requirements in 2009, said: “Nebraska’s success demonstrates that college- and career-ready policies don't need to be one-size-fits-all. Rigorous academic standards are essential. High expectations are critical. We need to prepare our sons and daughters to compete in a knowledge-based, technology-driven global free market economy. Hopefully the results of this poll will continue to embolden state and local leaders to act, knowing that the public is fully behind them." "Through Achieve's American Diploma Project, state and local leaders have been working on the college- and career-ready agenda for over five years, and it is extremely encouraging to see that the public both understands and supports those efforts," said Sandy Boyd, Vice President, Strategic Communications and Outreach at Achieve. "The college- and career-ready agenda is not a partisan agenda. It's an agenda for the future of our children and our nation, and the public rightly expects that achieving it is not beyond reach but is entirely possible." Public Opinion Strategies and Greenberg Quinlan Rosner Research conducted the national survey of 800 registered voters on behalf of Achieve between May 23-26, 2010. The survey has a margin of error of +3.5%. For additional information on the survey including a Power Point presentation and report, visit www.achieve.org/AchievingthePossible.